17-year-old Grace wakes up in a white room, with a table, pens and paper - and no clue how she got here. A story of dark secrets, intense friendship and electrifying attraction. The thing I liked best about this book is that it was original in its ideas, concepts and execution along with being an engaging and pacey read which never left me bored or hoping something would happen. Entangled is a story told by Grace of her recent past history as she tries to come to make sense of the situation she has found herself in. She has just woken up in a completely white room left with nothing apart from papers and pens to occupy herself with. She has no ideas where she is or how she got there. The story flits between a diary format in which Grace describes the here and now and parts when she discusses events that have happened previously in her life which mainly centre around the relationships she has with her best friend, her boyfriend and her absentee mother. Grace is a funny main character. She isn't always all that likable, she can be very demanding and has quite a hard personality to allow you to warm to her. I actually quite liked this about her that she wasn't all sweetness and light and found finding out about her all the more interesting for it. I didn't connect as well with the other characters but they were also intriguing within themselves. The book dealt with issues surrounding self harm in a thoughtful and insightful way which I thought was a nice touch as you got behind the psychology of why someone might self harm. The only little niggle I had with this book was the amount of alcohol the girl consumed as a routine thing. I wasn't sure it was entirely realistic either that or I clearly must have been a tame teenager. I loved the final part of the book where it opened up all the mystery surrounding the white room and why Grace was there. I didn't figure it out and thought it was cleverly done. All in all a book I really enjoyed that was refreshingly different and pacey. I will be waiting eagerly to see what Cat Clarke produces next. Looking forward to this one. It sounds pretty dark. Hahaha, I am definitely a tame teenager, but there are some people at my school...oh man, they are wild. 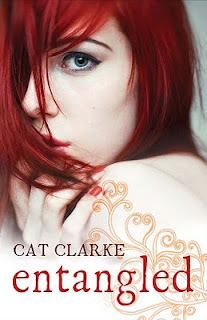 I completely adored Entangled. I was a pretty tame teenager myself, my sis not quite so much. I know a few teens who would have consumed about at much as Grace does. I loved the psychology behind Grace's character too. Such an emotional book. This one sounds very unique! Look forward to reading it soon! Loved this book so much. You're right it is very original and I thought the pacing was really well done. I really liked that Grace isn't your typical main character, lots of readers have said she's a bit unlikeable, but I really warmed up to her as it went on.. Made her so much more interesting.